More Wii Shortages This Holiday Season? Though Nintendo continues cranking out more units of its popular console, it might not be enough this holiday season. Failing economy be damned; people are still nabbing up Wiis like they are delicious, syrupy hotcakes. It's almost two years after the system's original launch, and some folks are still having a hard time getting their hands on the darn things. Nintendo of America president Reggie Fils-AimÃ© recently told the Los Angeles Times the gaming giant continues to boost Wii production significantly. Even so, he's unsure if they'll be able to meet the demand over the holidays. "Nintendo has continually raised the production levels of the Wii hardware. We're now producing 2.4 million units a month worldwide. Last year, we made 1.6 million a month. So we've made a 33 percent increase," said Fils-AimÃ© "One of our competitors' projects they will sell 10 million consoles worldwide this year. For us, that's three months of production. We're producing an unprecedented level of hardware to try to meet demand." Despite the grisly state of the economy, Nintendo hasn't seen any negative impact in regards to Wii and DS sales, according to Fils-AimÃ©, who touted the two platforms for driving the majority of financial growth in the industry in the first nine months of 2008. In fact, he said retailers view the Wii and DS as a means of drawing customers to their stores. With the Wii continuing to sell out at retail and the DS still going strong, Nintendo doesn't expect to see things let up as the holidays approach. Whether or not it can keep up with consumer demand is another question. 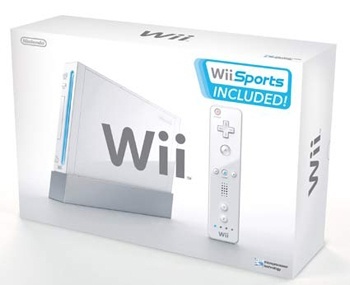 Hoping to track down a Wii this holiday season? Fils-AimÃ© suggests keeping a close eye on store circulars and checking out their websites. Like, duh. And when you see one; buy it. "We're flowing products into stores on a very regular basis. Once you see it on the shelf, you ought to buy it," he said. "While we're bringing 50 percent higher level of supply into the market this holiday, we don't know if the demand will be even higher than that."